On this historic morning, I begin my first blog entry for my new clinic. Most of my career has been dedicated to treating often life threatening emergencies. When I was younger, treating a multiple trauma patient, a patient with an acute stroke or myocardial infarction (heart attack) got my adrenaline going. I was doing something good with my life. I was “helping people” in a way few others could. Certainly, that brought me great satisfaction and fulfillment. So did those years in academic medicine helping to establish new residency training programs within university medical centers. Yet, why were we noticeably declining in health as Americans over just a couple of decades? What was going on? It seemed many patients I treated in the emergency department knew more than I did about nutrition and health. I decided to do something about it. In 2013, I obtained additional training and certification in the new sub-specialty of Integrative Medicine. Integrative Medicine is now where Emergency Medicine was 30 years ago. I guess I’m just attracted to new frontiers. I don’t have all the answers, yet I understand much more than I did before I started this new journey. I’m beginning my Integrative Medicine clinic in Spring City, Utah to help my future patients sort out what is only hype from that which has a scientific basis and could reasonably be followed to optimize health. My intention is to provide useful information on this website that– if applied– would assist you to better health. If I am at all successful in this regard, you may not need a formal consultation with me. What is important is that you begin today to take charge of your own health. Pick something you feel you can change. Don’t try to do everything all at once or you’ll drive yourself crazy and be more likely to give up. I’ve found that if I’m doing something each day a little more in line with optimal health–that is enough. Maybe that strategy will work for you. Gradually, you may find your little successes will begin to add up helping you move toward a happier, more productive and enlightened life. I’m one step closer to opening my clinic. Hopefully all who need to will be able to see the sign on the door of my clinic. I just spoke with my first scheduled patient today, wondering how she found me, since I’ve not officially opened and I have not advertised. 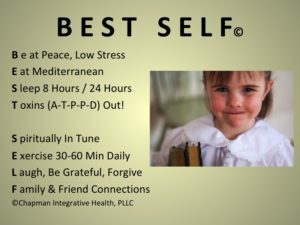 She said she found my name a couple of years ago when looking for physicians recommended by the American Board of Integrative Holistic Medicine. Interesting, that she decided to look me up now within weeks of opening my clinic. It is my hope that those I am uniquely suited to help will find me here. 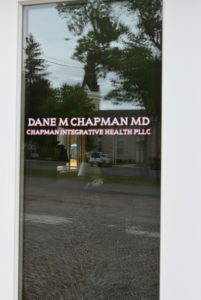 Chapman Integrative Health PLLC’s new clinic space at the Osborne Inn is taking shape. It is in the red barn, through the white double doors, although the space is not yet suitable for seeing patients. So meanwhile patients are being seen at the Osborne Inn. There are no appointments available until mid-July. If you have a quick question and you are not quite sure of what to do, email me at danemchapmanmd@gmail.com. I’ll at least get you pointed in the right direction. Cheers! 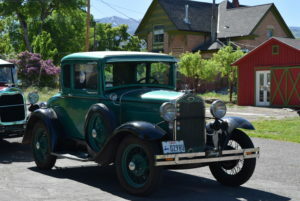 Today is a big day in Spring City, Utah. Sirens, honking fire truck horns, and fire station alerts began at 0630 hours this morning. 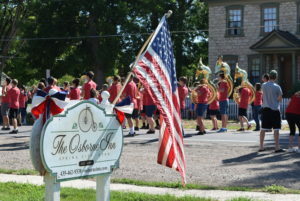 This is my clinic morning, yet I think we will all be watching the parade at 10:00 a.m.. Spring City was first settled by Mormon pioneers in the early 1850’s. When we purchased our home here in November 2004 there was an old log structure to the back of the property that was reported to have been the first dwelling place. It was later reconstructed with the help of Orson and Ben Kimball to what is now Cooper’s Cabin at the Osborne Inn. The William & Margaret Osborne family built a victorian era “pattern house” in 1894 which has been restored to some of it’s original spender with modern conveniences of spa tubs and comfortable beds, gas fireplaces and central heat in the winter and central air conditioning in the summer. This was a family renovation project mostly undertaken in 2006 in which each of our seven children contributed their talents and skills. We plan to hold medical retreats at the Osborne Inn as my clinic grows. Happy Pioneer Day! My wife Barbara and I just returned from the 2018 Annual Meeting of the Academy of Integrative Health & Medicine (AIHM) in San Diego, CA. We attend every year we can as it is the most up to date, evidence-based conference on the latest findings on health & medicine. 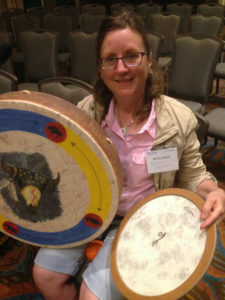 The picture to the left is Barbara at a previous AIHM conference session teaching the use of drum therapy to engender social connectivity. I was amazed, it really works! 1. Leading “think tank” experts who are good at forecasting (not predicting) future events which they determine by looking back 50 yrs to see- not trends, but disruptions. They then forecast likely scenarios so that leaders in any discipline can be inspired to prepare for likely future events. The speaker, Bob Johansen, Ph.D. also informs 3 star generals at Army Training Headquarters in Carlisle, PA. I found it quite interesting that “power” as we know it today will likely continue to be distributed to the people throughout the world as has happened with the “power of knowledge” spread through the internet. I find this concept liberating. He gave Airbnb as an example. Computers now use a binomial language (0-1), like flipping a coin. Computers will soon be able to compute “like spinning the coin”, with so much more power in multiple dimensions. This will allow the determination of solutions to identify complex patterns that we do not now understand. 2. Glyposphate, the principle poison in Roundup, has caused many problems in our health. It is water soluble–and even though supposedly is active only a short time, gets into streams, rivers, and other waterways. The distribution of cancer has shifted in the past few decades from the industrialized areas of the US to the major river basin areas draining the midwest where Roundup is used on 90% of the GMO corn and soy, and even the organic wheat where it is used to cause premature plant death and early harvest. The lab research also supports glyphospate as the culprit. It appears to modify wheat to the point of causing glutin sensitivity in humans. Also, by changing gut bacteria, glyphospate and other agents including toxins and antibiotics are thought to be contributing to a major increase in clinical depression within 12 months after exposure. Scientists now think they know why. The good gut bacteria produce the precursors for the brain neurotransmitters and there is a direct communication through gut innervation. Antibiotics or toxins like glyphosphate kill the good gut bacteria, and thus decrease gut production of neurotransmitters essential for good mental health. 3. The early pioneers in holistic medicine didn’t know very much, but they knew more than the other MDs/DOs at the time. Gladys McGarey, MD, one of the remaining living original pioneers stated they began to share what little they knew- starting about 1949 in the US, then brighter students carried the ball forward. Dr Glady McGarey, 2 yrs short of 100, and looking like a 70 yr old, shared that history. 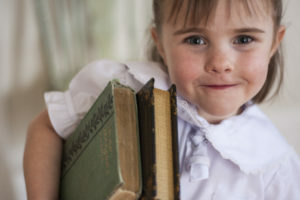 So share what you know- it may just inspire someone else smarter (and younger). 4. Our guts are really our brains in many respects as explained by Patrick Hanaway, MD and others. As mentioned above, glyposphate and other toxins are killing our good gut bacteria that produce most of the neurotransmitters of the body–way beyond what the brain itself can produce, and supplies them directly through peripheral and central nervous system connections within the gut itself. It is better to use pre-biotics (e.g. asparagus, artichokes, onions) to promote good gut bacteria growth than try to temporarily increase the ratio by eating live cultures of good bacteria in the form of probiotics (e.g. Kefir, cultured yogurt, etc). However, pro-biotics are still recommended after a known gut insult like a SAD meal, treatment with antibiotics, exposure to toxins, etc. 5. Alzheimer’s dementia is reversible if caught early according to Dale Bredesen, MD. More often than not experts are finding a nutritional deficit, infection like a tick-borne illness gone undetected, or a toxin exposure as a cause. The once thought to be causative, amyloid protein and even candida around brain dendrites look like they are protecting the brain from the deleterious effect of toxins or nutritional deficiencies rather than being the causative agents. 6. 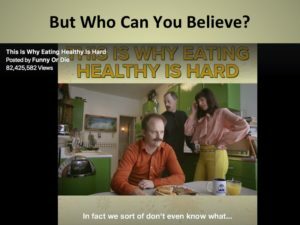 A single SAD (Standard American Diet) meal (like McDonald’s hamburger on white bread with fries and trans fat) can disrupt gut cell “tight junctions”, and promote leaky gut which triggers an immune response, foggy thinking, etc. ( I’m still sorting this one out due to my foggy thinking from that SAD meal I just ate). 7. One speaker, Zack Bush, MD, previous faculty at the Univ. of VA, now CEO of several startups, has done much of the work with glyphosphate. He also projects that we have about 16 yrs to turn this around before destroying the planet irreversibly. There were 3 speakers who also recently spoke at the Vatican re: climate change and what we can do. It turns out the fastest change occurs at the community level, hence the Pope invited Mayors from around the globe to this conference. At least one of those speakers was doom and gloom, but the others were helpful. One speaker gave an example of two mayors, back to back, who with the help of the people giving perpetrators feedback with a thumbs up or down when they witnessed an event affecting the community either positively or negatively, among other interventions. This turned Bogota, Columbia from one of the most dangerous cities in the world, to a healthy, vibrant city in a matter of only a few years. That impressed me and kind of went along with Bob Johansen’s Ph.D, comments mentioned above (#1). Future leaders will know how to mobilize others in positive directions of change. The power really is in the people. (If we only realized it). 8. A couple of comments on Acne. According to Dr. Donna Aiudi, MD, certain foods may be part of the culprit after all. She recommended an elimination diet avoiding dairy, cane sugar, and glutin for 4-6 weeks to get a complete clearing of the breakouts, then gradual reintroduction to see what the most offending ingredients are to be avoided. On December 3, 2018 I will be giving a presentation to Spring City residents on the impact lifestyle can have on optimal health. A summary of my presentation can be found here. Thanks to Jane Hawkes and co. for organizing a Spring City Health & Wellness group. We are fortunate to have neighbors to learn from with special talents and training in medicine and several of the natural healing methodologies. I presented an overview of lifestyle practices that promote optimal health. You can view key slides from the talk here.